Volunteers are essential to the work of the Reuse Centre and contribute in a variety of ways. We offer a fun work environment, flexible shifts and a great recognition program! Organized groups of 4 or more volunteers assist by sorting donated items at the Reuse Centre. Individual volunteers contribute monthly articles and content for the Reuse Centre blog Reuse-It Edmonton. 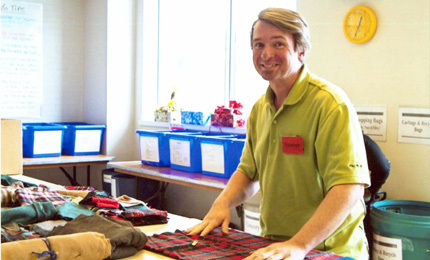 Individual volunteers assist with activities at facility events including reuse crafting, facility tours, greeting customers and more. Interested in volunteering with the Reuse Centre? Visit our Volunteer Opportunities.